"I fear we will get an extension of Article 50 and what you will hear is voices in Westminster pushing for a second referendum," he told Good Morning Britain. Mr. Farage also said he "prays" that Britain will leave the EU on 29 March. The former UK Independence Party (UKIP) leader has remained an outspoken proponent of leaving the EU, stating that he believes that Westminster, not the public, wants a second referendum. Mr. Farage also called for Mrs. May's resignation, stating that if she had any "honour" she would quit as MPs press for a second referendum. 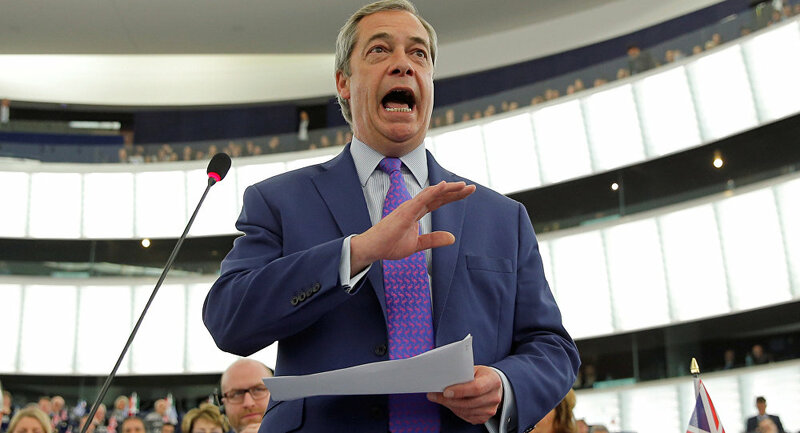 "I think and I fear we are headed on a path towards delays and probably a second vote," Mr. Farage told Sky News. When asked how the UK should proceed, he said that Britain should abide by World Trade Organisation rules and that the EU would continue negotiations despite Britain leaving on a no-deal. Speaking on Mrs. May, he said: "There is still time, Brexit is not the problem, the Prime Minister is. She needs to go." UKIP leader Gerard Batten said in a press statement obtained by Sputnik that the Brexit vote results were "no surprise for anyone", adding that Mrs. May's agreement achieved the impossible by uniting Leavers and Remainers who opposed her plan and that "only Mrs May's most ardent supporters could have supported it." "We now enter a deeply uncertain period as the political establishment continue their project of stopping Brexit," Mr. Batten said. "Mrs May and Parliament have brought about the greatest constitutional crisis since 1642. They have done all they can to thwart Brexit and we are now back to square one." He added that UKIP was the only major party "committed to leaving the European Union" and was "prepared to continue the fight for Brexit whatever may come." The Prime Minister faces a no-confidence vote in Commons Wednesday evening, which was tabled by Labour and opposition leader Jeremy Corbyn shortly after the Commons vote, in addition to further calls to extend Article 50 from Remainer MPs. Mrs. May's Brexit deal was overwhelmingly rejected 432 to 202 Tuesday evening, leaving the government three days to submit a contingency "plan B" Brexit plan, in addition to ten weeks to sort out Brexit negotiations by the 29 March deadline.